"Presentations focus on practical applications of current experimental psychological and neurobiological developmental studies, including current developments in EMDR, sensorimotor, and other research-based treatments. Learn about:1. Current developments in treatment of trauma including EMDR and Sensorimotor psychotherapy.2. The incorporation of the body in treatment of trauma patients3. 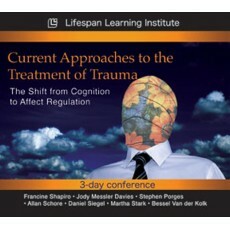 The effects of trauma on affective, cognitive and behavioral dysregulation. 4. Approaches to dynamic regulation of states of consciousness.5. The importance of disorganized attachment in understanding the affects of trauma. "